Root canals are very complex, with many small branches off the main canal. 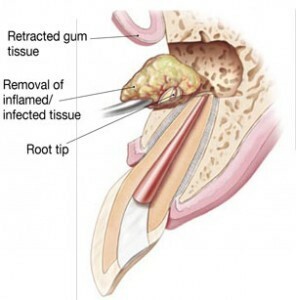 Even after the root canal treatment, infected tissue can remain in these branches at the tip of the tooth. This infected tissue can prevent healing and cause re-infection. 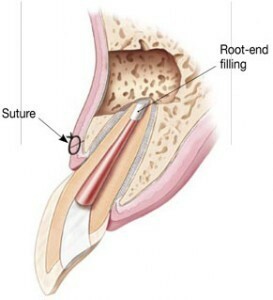 During an apicoectomy, the root tip is removed along with the infected tissue. 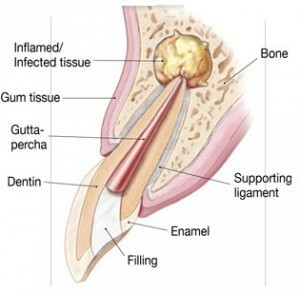 A filling is then placed at the tip of the tooth to create a seal preventing further infection. This procedure is generally done using local anesthetic. The endodontist will also use a microscope and check for any cracks or fractures in the tooth. The light and magnification from the microscope will allow the endodontist to see the area clearly. A consultation for the procedure is necessary prior to treatment. The endodontist and one of our staff reviews everything you need to know about for the procedure. We recommend that someone drives you home after your surgery appointment. You may be given an antimicrobial mouth rinse, a medicine to reduce inflammation, and/or antibiotics to take prior to your appointment. The area around the surgery site is will be tender for a couple days and may bruise and swell. Pain can be controlled with pain medication. Ice the area to reduce swelling immediately after surgery for the 10-12 hours, alternating 15 minutes on 15 minutes off. Our staff will recommend what to eat and drink after the procedure. You will schedule a follow-up appointment for one week after surgery so we can check healing and the tissues around the tooth.